You cannot bear your children’s burdens for them. On Wednesday, our 12-year-old son, Barron, began a two-year journey with orthodontia. My wife and I can commiserate, but we cannot take away the discomfort and self-consciousness. As one of my former editors used to say, it’s his bear to cross. I’m sure Barron is under no such delusion. By the grace of God and my mother’s good dental genes, I avoided braces altogether, but I remember coming of age in the ‘70s and ‘80s when a prescription for braces as a teenager was a death sentence for popularity. I can clearly recall several instances of friends who had to undergo the painful process of orthodontics, erasing their smiles for two to three years and earning such unflattering nicknames as “metal mouth,” “brace face” and “jaws.” It was even worse for the kids who had to wear headgear attached to their braces. In reading up on orthodontia, I learned that braces are now nearly ubiquitous. From 1982 to 2008, the number of teenagers with braces has increased by 99 percent. Gone are the days of the snaggletooth Southern stereotype. In the New South, wearing corrective braces is a rite of passage common to nearly every teen and pre-teen. My wife is the one with orthodontic experience in our household, and she has offered reassurances that there is life after braces. It’s probably better that she be the parent with empathy because I suspect our boys would rather have her for comfort than their often less-than-sympathetic old man. After having watched or listened to the Wonka remake about 150 times, I couldn’t help but picture these braces when I first learned Barron would have to be subjected to orthodontia. I don’t know how normative her experience is, though. She reported to have desired braces so much in her pre-teen years that she used tin foil to pretend to have braces. To her, orthodontics was the status symbol of cool, teenaged girls. Barron will not be alone in his misery. One of his buddies has already been through braces, getting them at the age of 10 and recently having them removed. Another friend has them now and has been a good peer guide through the process. His younger brothers, though, haven’t been as sympathetic. “Uh, Harris, you know you will be going down this road yourself in a couple of years,” I reminded our 7-year-old. After the first week with braces on his top teeth – the bottom braces will be installed in about six months – he’s managed to deal with the soreness, find a way to keep them clean and work around the new protrusions to make his requisite trumpet embouchure. More adjustments are coming, I’m sure, but at least for now, we’ve not had to deal with any questions about kissing. “You won’t be able to kiss any girls,” Harris rejoined with a wide smile. “That’s the least of my worries,” Barron said. No, that’s the least of OUR worries. Probably at the top of our list, right under his pain, is our financial pain. Braces aren’t cheap. I’ve used installment plans and credit to purchase everything from mattresses to cars to homes, but I never imagined I would be employing these financing tools to make my kids’ teeth straight. This isn’t the first nor will it be the last time I am surprised by a big-ticket expense in raising children. So as my expedition with orthodontia begins, I welcome the collective wisdom of you who have traveled this road before me. What do I have to expect? What do I have to dread? What do I have to celebrate? It may not take a village to raise a child, but it certainly takes a bank. Leave your comment below and share how you coped with your own braces or your child’s braces. We’ll all benefit from your experience. This entry was posted in Uncategorized and tagged braces, brothers, children, children getting braces, contemporary South, family, Lance Elliott Wallace, Lance Wallace, New South, New South Essays, NewSouth, orthodontia, orthodontics, parenting, South, Southern, Southern Culture, Southerners, teenagers getting braces, the South. Bookmark the permalink. No pictures of Barron? Maybe you will send one in private. I did not receive the subject’s permission to release his image. He did approve the blog, though, before I posted it. As a survivor of orthodontia, I advise that you make sure they don’t do any major adjustments before a holiday or birthday. My orthodontist was kind enough to CEMENT my appliance into my mouth the week of Thanksgiving. While I’ll never forget having all of my food ground up in a baby food grinder, it’s not the kind of unforgettable Thanksgiving experience I had hoped for. That’s good advice. Thanks for sharing from your bad experience. I suspected as much, but being greater than three also works. I had braces in middle school for nearly two years. 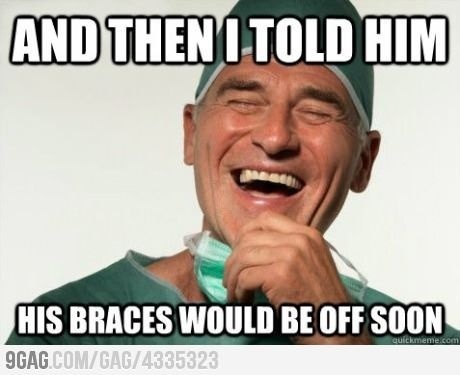 I remember the day I got my braces and the day they came off, but not much in-between. My experience was similar to Carla’s. When I got them off, I was glad I had them in middle school (as opposed to high school) and I loved the end result! Barron will be just fine. Good luck, parents!